The start of the Paris Roubaix Challenge was a little underwhelming with small groups setting off whenever they wanted and no health and safety briefing that we Brits are used to at every sportive, a more French ‘if you’re doing it, get on with it, I don’t care’ attitude sufficed. At the start of every sportive, you always go faster than average. I was in a group with 4 other guys from the Paris Roubaix trip and we ended up tacked onto the back of a group doing easy 18-20mph on the flat before we hit the first section of cobblestones after nearly 10 miles. I was the only person who had a bit of a recon on something Roubaix-esque in Norwich so I went off and attacked the stones. I caught up and passed two randoms, dodged lots of bottles which at the first sign of bumps had escaped their cages. It was immediately obvious from this section that the Paris Roubaix cobbles were worse than the tamer ones in Norwich city centre, the section crossed a main road halfway through and not wanting to get taken out by a car I tried to use my brakes – it turned out that the vibrations had completely wrecked the gripping muscle in my forearm and was stopping messages getting through, luckily as it turned out I didn’t need the brakes as Gendarmes were stopping the traffic anyway. I ended up finishing the 1.3 mile section 30 seconds quicker than the others. We all ran Strava which provides GPS tracking and then has various short segments where people race against each other for the best time. This was one of the few early Paris Roubaix sections where my chain didn’t decide to fly off. We went quite quickly over the next few sections, which all just appeared from nowhere round a corner and were always a shock. About the only other section that I was genuinely quite quick on was at Saint-Python where I clocked the 20th quickest time of the weekend out of 108, helped by a lack of personal regard for safety down the 50ft drop for the last part of the section. As a comparison though, I did the 0.9 miles in 3mins14secs, a Pro did the same during the Paris Roubaix race the next day in 2mins 20secs. We stopped at the feed stop after 50km and I finally got some drink into the water bottles, managed to drink one bottle before getting to the halfway point. A lot of the following sections merge into one after this point, which probably shows that I was beginning to tire and was zoning off inside myself and not thinking much. It’s surprising how easy it is to do that when cycling, there was a point on the training ride on Friday where I realised I couldn’t recall any roadside features from the last 30 minutes. 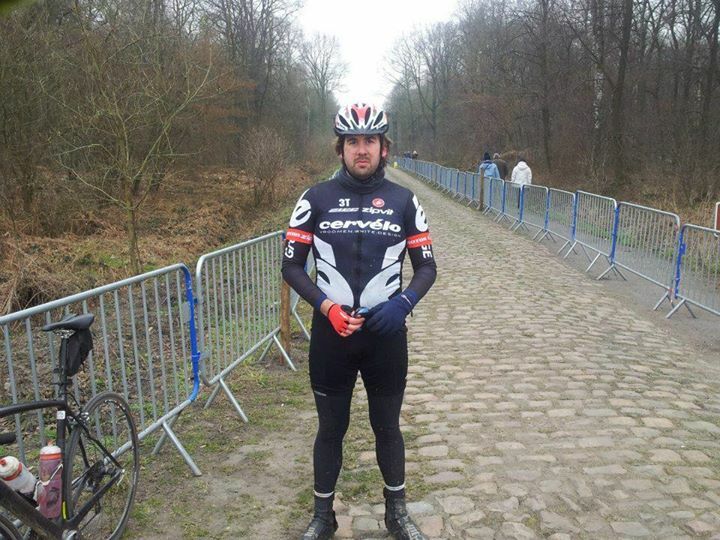 I do however, remember the Arenberg. The Arenberg is the picture that most people have of the Paris – Roubaix race, it’s a 1.5 mile section, dead straight, through the forest and is rated at 5 Star difficulty (all the sections are rated by the organisers and only two are 5 Star). We stopped and took a couple of pictures at the start which was probably unwise as we should have used the preceding downhill to build up speed to really attack it. I certainly found it hard to get up to speed whilst trying to clip in and avoid someone who I thought looked like Sean Kelly being filmed (I heard on the coach later that someone had seen him being filmed from a bike on the Arenberg too, which matches). I found the whole thing a struggle and could only really trundle along, it certainly got harder when I decided to do the Pros Paris Roubaix move of crashing there by bouncing off the cobbles to the right and getting my pedal caught in the metal railings set up for the race the next day. I ended up going over the handlebars and was sat on the ground facing the way I’d come with my legs somehow unclipped and the bike on top of them. I did a quick sit rep and didn’t appear to be hurt, the phone in my back pocket was somehow unsmashed, so I got back up and rode to the finish. The ‘sod this’ mental switch was pressed and I went as hard as I could to the finish overtaking the loud brash Kiwi from the bus and giving him an allez as I went past. Kharma unfortunately immediately kicked in as I lost a water bottle to the cobbles and predictably it wasn’t the empty water bottle that went but the full one. As I didn’t go past another feed station with water, I didn’t get any more water until back on the coach at the end in Roubaix. The second part explains what happens when you have no spare inner tubes, how much the French like cyclists and what cycling through Belgium on your own towards Roubaix is like. Very cool . . . nice kit! Thanks! I don’t see many people with a Cervelo kit out and about, they were almost a flash in the pan!